Connie Knauer, center, with his sons Conrad, left, and Robert, right, in the new selection room at their facility in Joliet, IL. We took a trip to Joliet, Illinois last week to visit long-time friend and business partner Connie Knauer in preparation for an upcoming ad campaign featuring our strong dealer network. As we toured their facility we were truly amazed with the quality of their vaults. 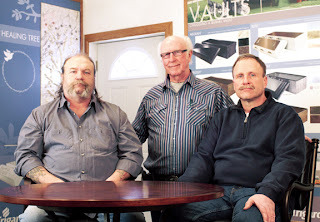 For nearly 40 years, the Knauer family has built their reputation in the Chicagoland area. Nearly every vault that leaves their plant has been touched by an owner's hands. But Knauer Industries is more than precise vault corners and beautiful finishes. Vaults aren't just transactions with a funeral director or cemetery. 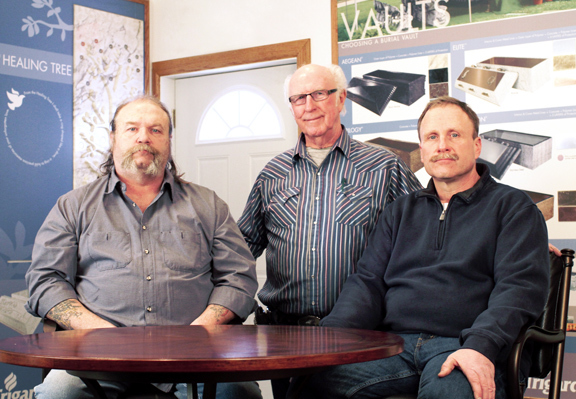 Vaults help families protect their loved ones.